As you have probably noticed by the lack of updates on our sneaky website, we are some busy Mammoths. We are currently working on a big game project for the Dutch government. The purpose of this game is to explain the environmental law (Omgevingswet). November last year we and three other game studios participated in a gamejam organized by the Government and the Dutch Game Garden. 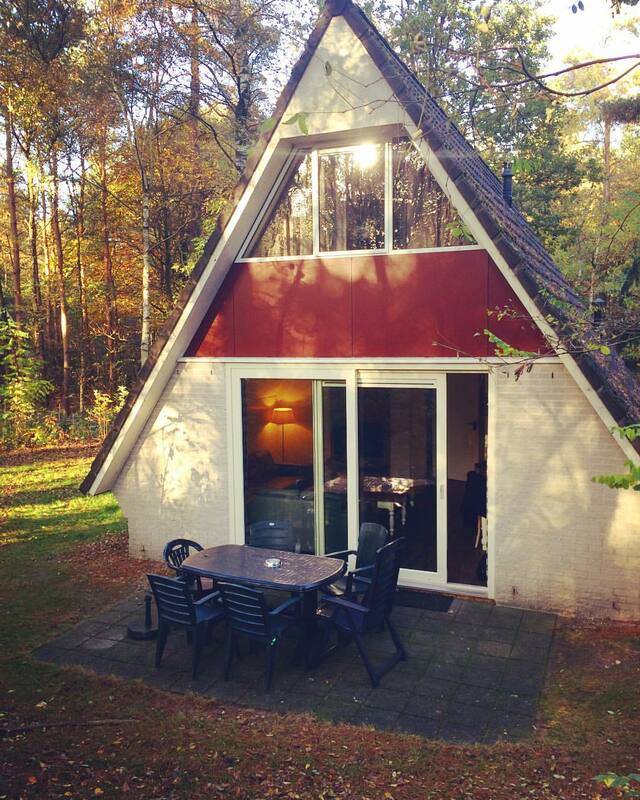 The four-day jam took place in a bungalow park near Utrecht. Each team had their private bungalow to eat, sleep and jam in. It was an awesome but exhausting time, because as many of you probably know, you usually don’t sleep (much) during a gamejam. But the exhaustion and the hard work was all worth it since we won the jam. Winning, in this case meant getting a budget to develop the concept into a game. At this moment we can carefully start to call it a game instead of a concept. Tic-Toc-Tower will release today! 28th of September, on Steam! It’s been a great journey for us, and we’re totally psyched that we’re finally at this point. We’ll be on top of managing the game for the next few weeks. So please make sure to check out Tic-Toc-Tower on Steam! And you can check our trailer here: Launch Trailer! A special thanks to all of our Sneaky Tester for keeping up with our frantic updates! We’ll update the blog soon with a series of post-mortem posts where we’ll discuss the development for Tic-Toc-Tower. And our plans for Sneaky Mammoth after this. So for now, keep on climbing! It’s finally time to make our big announcement! SOEDESCO will be publishing Tic-Toc-Tower when it is released later this year! SOEDESCO is a Dutch multiplatform publisher of videogames, specializing in console and pc games. So far the publisher has released retail versions of Awesomenauts Assemble!, Teslagrad and Giana Sisters: Twisted Dreams – Director’s Cut with the Last Tinker just around the corner. Tic-Toc-Tower is our action packed puzzle and platforming game in which players have only ten seconds to complete a level! Rendered in charming pixel-art every random level also features an additional challenge. Players can choose to pursue the extra watch item in every level, picking up the watch will grant two extra seconds for the next level but is also an extra risk. With the support of SOEDESCO, we of Sneaky Mammoth will build Tic-Toc-Tower bigger, better en more challenging (that means more chaos too) than ever imagined! We finally woke up after a long and busy weekend at the Dutch Comic Con! 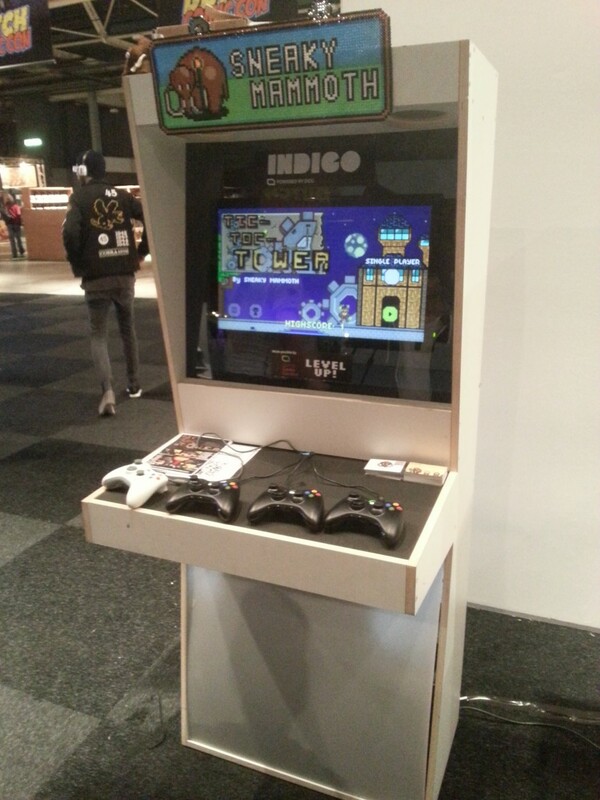 We were there to show Tic-Toc-Tower and promote our Steam Greenlight campaign. 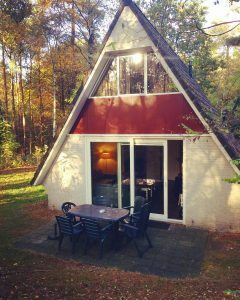 The Weekend was awesome! Lots of fun to be had! I’ve made pictures of the old Bat-mobiles and I’ve seen so many Marvel cosplay and more. Over 30.000 visitors were there, so it was quite busy. We didn’t even had the time to take a seat and relax. We had a little booth next to a lot of other Indie developers. Including 2Awesome Studio with their game Dimension Drive. We had a lot of great feedback and even met some of our Beta players. 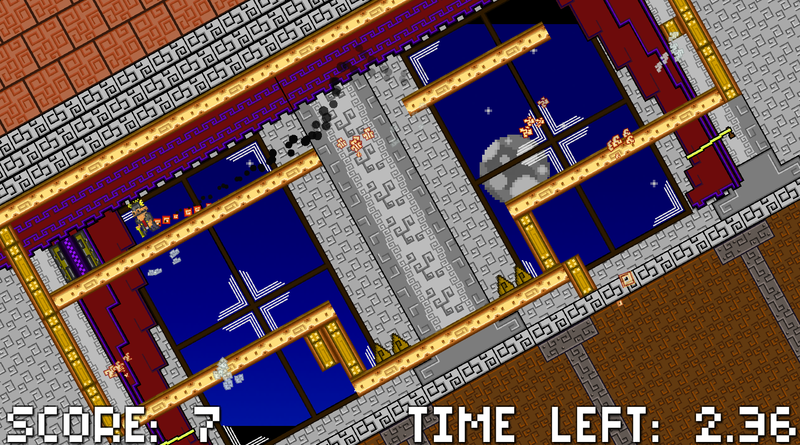 A lot of players liked the new multiplayer mode in Tic-Toc-Tower. Records broke and fun was had. After a while a waiting line formed to play the game. Some players even managed to keep up with me on the first try! Tic Toc says that Clock! Time kept on ticking for a long while. Busy we were, but with a smile! Ok, I’ll stop rhyming now. Jay! Tic-Toc-Tower is finally a lot further into development! We have some new interns working on it (We’re helping too). The game is finally in a good state to show everybody what we made. you can check it out here. We’ll be looking forward to seeing you there! GamepitCon, 5 games, 10 seconds! First things first; Sneaky new years everybody! I hope you are ready for 2015, because we sure are! Last weekend we were at GamepitCon, hosted by Gamepit. 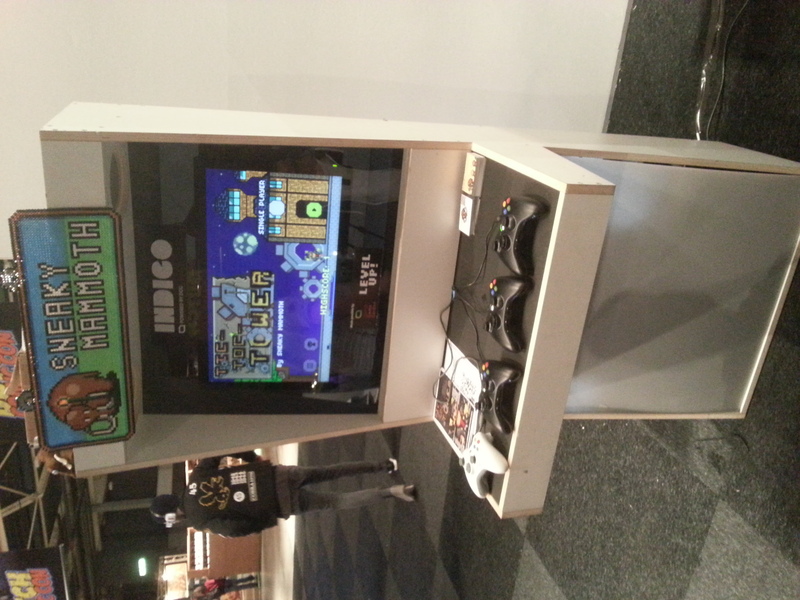 We had a great time showing our new and upcoming game; Tic-Toc-Tower. As an extra, we had a small contest running. The top 5 in the leader boards of Tic-Toc-Tower were given a price. The prize was small beaded character of you, pixelated on the spot! (yeah, Hans was very very busy pixeling and beading and ironing and what not) The game was received extremely well. Especially for a game (rather the prototype) we finished just the night before. This was also good boost for us to go and finish the game asap. In short now; What is Tic-Toc-Tower? The game features quick-paced platforming action (of DOOM). You’ll get a random level from our large array of levels. You have 10 seconds to complete the level and get an new random level to complete. For each level you finish, you’ll get 1 point. You have running, jumping and ducking at your disposal to do the best you can! Tic-Toc-Tower was one of the games we developed during our Mega Mammoth Mania Month. Our other games are really fun as well, yet Tic-Toc-Tower was the best.